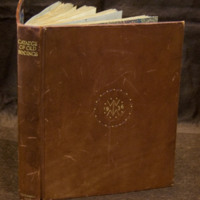 In 1936 William Inglis Morse bought the collection of historical bindings that Douglas Cockerell had assembled when researching the evolution of binding styles and techniques. The two-volume descriptive catalogue of the 127 titles in the collection was compiled and bound by Cockerell. The catalogue provides important documentation of how Cockerell honed his craft. 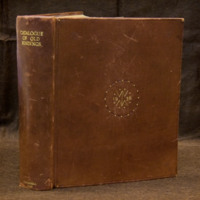 In 1937, William Inglis Morse presented Cockerell's historical binding collection to the Dalhousie University Libraries. Today Cockerell's historical binding collection still continues to inspire and instruct. For more information about this collection please contact the Special Collections Librarian, Karen Smith ( Email: kemsmith@dal. ca or Tel: 902-944-8803). Cockerell, Douglas B. Catalogue of Old Bindings collected by Douglas Cockerell, bookbinder of Letchworth, England... Vol. 1-2. [Letchworth, England: The Author], 1936. Vol. I - 68 pages; 36 pages of mounted black and white photographs; 26 cm. Vol.II - 180 pages; 90 pages of mounted black and white photographs; 26 cm. A bound catalogue describing 127 titles with interesting bindings collected between the early 1890s and 1936 by master bookbinder, Douglas Cockerell. 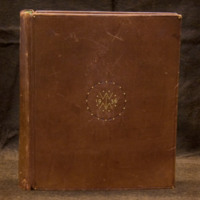 The first volume contains single sheet typed descriptions of the first 32 titles. Each description is followed by at least one black and white photograph of the title’s binding mounted on heavy medium gray paper. The second volume contains the titles numbered 33A to 107. The typed descriptions on the versos of the pages consistently contain the title, a collation statement and binding information. For a few titles some biographical and/or content information is added. Manuscript notes by Douglas Cockerell on approximately a quarter of the descriptions provide additional binding and provenance details. 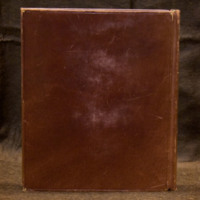 Both volumes are bound in full medium-brown morocco leather. 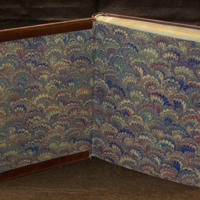 Single blind tooled fillets frame both front and back covers, and at the corners are single gilt dots with a single leaf on either side in blind. 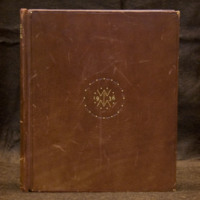 The front covers are decorated with a central motif composed of the gilt monograph “WIM” (for collection owner William Inglis Morse), the letters arranged vertically, with the “W” on top, the “I” in the middle,” and the “M” on the bottom, the “I” connecting the peak and valley of the “W” and “M,” respectively. The date (1936), in gilt, is split on the left and right sides of the “I.” The monograph is encircled by alternating small leaves in blind and gilt single dots. The title of the volume, “Catalogue of Old Bindings,” is gilded on the spine, and at the foot of the spine, in gilt: “Cockerell 1936.” The leather turn-ins are outlined in single blind fillets, with one fillet at the inner edge and the second on the outer edge. Each corner is decorated with a single gilt dot and a single leaf in blind on either side of the gilt dot. 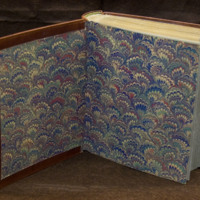 End papers employ the distinctive Cockerell marbled pattern in lush tones of green, blue, red, and cream inks; and “D.C. & SON 1936” is stamped in blind on the lower left corner of the back cover turn-in. Even though the catalogue is very much a basic descriptive record of a binding collection, it is given an elegant and visually pleasing binding. 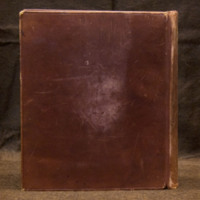 The skill of the master bookbinder is seen in the design of the binding. To accommodate the single sheet descriptions and the many sheets of mounted photographs, an elaborate internal structure was constructed. The marbled paper used for the endpapers was especially pleasing and added to the creation of a special catalogue for a set of treasured volumes. *The same binding is on both volumes.